We all know that a diet rich in fresh fruit, vegetables, and lean meats and seafood is integral to our wellbeing, but how many of us actually know why? All food might seem the same in many peoples’ eyes, but what you eat has a direct impact on what sorts of nutrients your body receives. In this way, your body is a bit like a car; without the right fuel, it won’t run properly. More than that, too long with the wrong fuel, and you could cause serious damage. That’s why it’s so critical that we eat a wide range of foods, or if that’s not possible, supplement where we can. In fact, given how difficult and confusing it can be to eat well all the time, supplements offer one of the best and simplest ways to ensure proper nutrition. Potassium-Pro™ ionic potassium is a market-leading potassium supplement brought to you by experts in the field of mineral nutrition. Formulated in a liquid ionic solution, Potassium-Pro™ is easily and quickly absorbed. With its metered dropper, you can adjust your dosage to your needs, ensuring you’re always right on nutritional target. It’s non-GMO, free from allergens and gluten, and vegan friendly, so you can be confident about what you’re putting in your body. With the addition of 72 trace minerals through a proprietary blending process, it’s tremendous value for money and your health. Potassium is a trace essential mineral; that is, although our bodies require it, they cannot make it internally, and it must be obtained through what we eat and drink. As the body cannot store it efficiently, you need to find a high quality, regular source to stay healthy. Why do I need potassium in my diet? Potassium is required for a wide range of mechanisms within the body and without the proper amount you can seriously compromise your health. Potassium is an electrolyte, which means the body requires it to carry electrical impulses, allowing muscles and nerves to function properly. Potassium also helps maintain the body’s fluid balance when you consume acidic foods or drink. Potassium is essential for good cardiovascular health, and controls the rate at which heart muscles contract. We all know that sodium, or salt, raises our blood pressure, but did you know that potassium lowers it? Calcium and vitamin D are generally associated with strong, healthy bones, but it is potassium that regulates the levels of calcium within your skeleton. What happens if I don’t get enough potassium? Because of potassium’s wide-ranging and numerous benefits, a deficiency in this crucial mineral can have severe consequences for health if left untreated. Heartbeat irregularity, dry skin, fatigue, poor digestion are all symptoms of a potassium deficiency. High blood pressure is one particularly dangerous symptom of potassium deficiency. Although potassium is an effective means of lowering blood pressure, it is often counteracted by the high content of sodium in our diets. Unfortunately, while potassium is only present in large amounts in fresh foods, salt is found in nearly everything we eat, and particularly in processed foods. This means that without a rich source of potassium in our diets, we open our bodies to a wide range of ailments and disease. 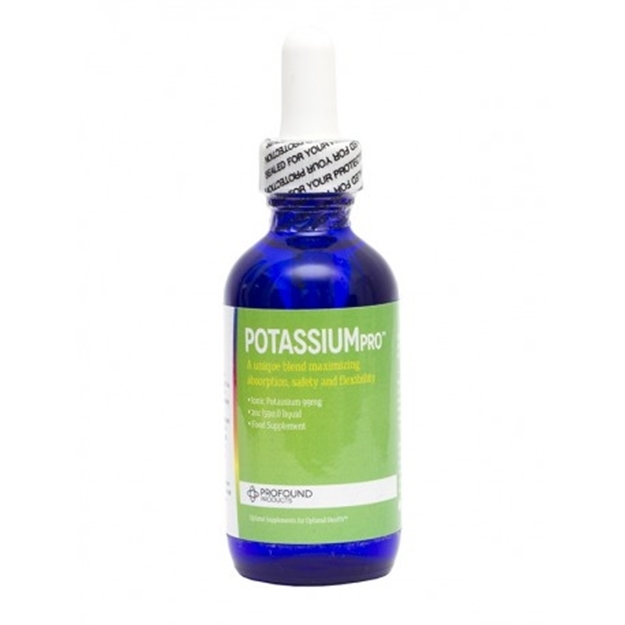 If you’re concerned you’re not getting enough potassium, Potassium-Pro™ is the ideal solution. Why spend your life feeling anything less than 100%? Other Ingredients: Sea Minerals, ConcenTrace®, purified water, potassium chloride, citric acid. Potassium-Pro™ contains over 72 ionic trace minerals from ConcenTrace®, a trade name for concentrated sea minerals from the Great Salt Lake.